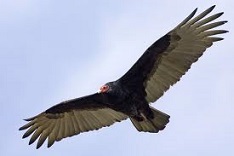 Turkey buzzards populate both North and South America and are called turkey vultures also. They’re known as the carrion crow in the Caribbean region while their biological name is Cathartes aura. It is one of the three species and it is the most common vulture in both South and North America. You can find them in shrub lands, pastures and deserts along with subtropical regions of the Americas. The Turkey buzzard is found from the southern tip of South America all the way up to southern Canada. It’s interesting to see that they are available in this region because they feed on carrion and dead bodies of different animals which populate the country. The genus and species of this bird family contains a total of six vultures and includes both the greater and lesser yellow headed vulture in the same genus. This large vulture is quite heavy and weighs between .85 up to 2.26 kg on average. Its wing span can spread up to 72 inches in width and 32 inches in length. The plumage of the bird ranges in color from dark brown all the way to solid black. The neck and head do not have any feathers on them but are purple to red in color. Its beak is a short, ivory colored protrusion with a sharp hook end to it. The turkey buzzard can survive for 16 years or more in the wild and for 20 years or more in captivity. This bird is a scavenger and feeds on dead bodies and carrion. It can scout out carrion because of its sharp vision and sense of smell. Decaying bodies give off gasses which are detected by the Turkey buzzard, thereby guiding it towards its preferred food. Interestingly, by using thermals to manage its flight pattern, the bird rarely needs to flap its wings when flying. It resembles an airplane floating in the air with precise movements and a straight flight pattern. These buzzards are very community-oriented and spend their life in groups where they mate and the parents both raise approximately 2 chicks annually. The baby chicks are fed through regurgitation. It is interesting to note that the turkey buzzard does not have a vocal chord and communicates by making grunting and hissing noises. The bird generally prepares its nest in caves, high trees that have a hollow on the inside or thickets. The population remains constant because they feed on carrion and do not have to fight for their food against predators. The reason the turkey buzzard has been given its name is a head that looks similar to the wild turkey which is commonly found throughout America. It is often called a vulture because that term is derived from the Latin language and means to rip apart, which is exactly what the turkey buzzard does when it feeds on the flesh of carrion.